This is a really cool building to tour, and has some GREAT history to it! Every time we go to Memory Grove Park, the meditation chapel is locked, so it's cool to have an opportunity to tour it! Mr. and Mrs. Ross Beason built the chapel in 1948 as a memorial to their son, Ross Beason, Jr., and all other Utahns who died in World War II. The plaza surrounding the chapel contains more than 300 granite markers each representing a Utah serviceman whose remains were not recovered after the war. The pink marble chapel features intricate bronze doors, stunning “acid etched” windows, and a patterned marble floor. Take some time to enjoy the chapel's contemplative atmosphere and lovely setting in Memory Grove Park. Utah Heritage Foundation also offers tours of Memorial House across the park from Meditation Chapel. These tours are also free and open to the public. 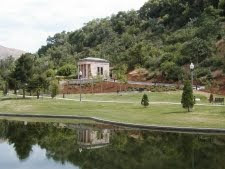 Afterward, enjoy a great lunch or picnic in Memory Grove Park.